PowerTye's E-Track Heavy Duty O-Ring fittings are compatible with all standard E-Track systems. Installs in seconds into a single E-Track slot and can fit multiple S-Style hooks. Fitting is rated to 2,000lb W.L.L. / 6,000 lb. breaking strength, with a strong welded O-Ring. Secure quick release makes inserting and removing fittinga breeze, while keeping fitting firmly in place in a standard E-Track slot. Comes in a pack of 6 E-Track Heavy-Duty fittings. 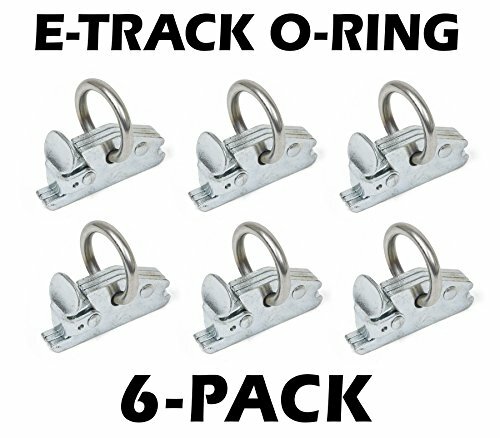 E-Track Heavy-Duty O-Ring fittings are great for trucks, trailers, pickups, or wherever you need to secure lots of heavy cargo. 2,000 lb Working Load Limit / 6,000 lb. Breaking Strength for a maximum security hold. Fits into all standard E-Track slots, features a quick-release button that makes inserting and removing the fitting a breeze! O-Ring measures 1½" Diameter, perfect for 1 or 2 S-Style hooks. Ring is made of extra thick Steel, much stronger than many light-duty E-Track fittings.